Browsing the interiors of the Parade of Homes is one of my favorite ways to gain inspiration and discover new ways to decorate each year. It’s like real life Pinterest! If you don’t know what Parade of Homes is (also called Street of Dreams in some areas), it is a showcase of new and/or remodeled homes held in many different regions. 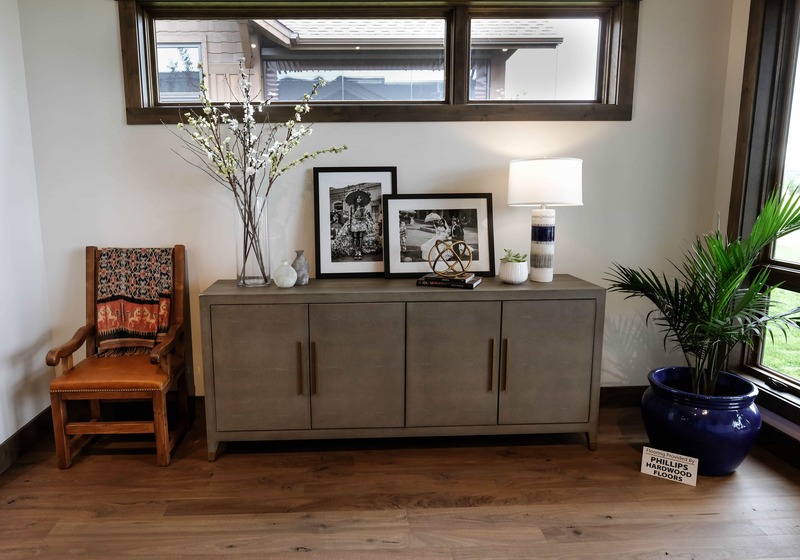 The Parade is a way for builders and designers to show off some of their best work while allowing locals to get an inside look at some of the beautiful real estate within their region. 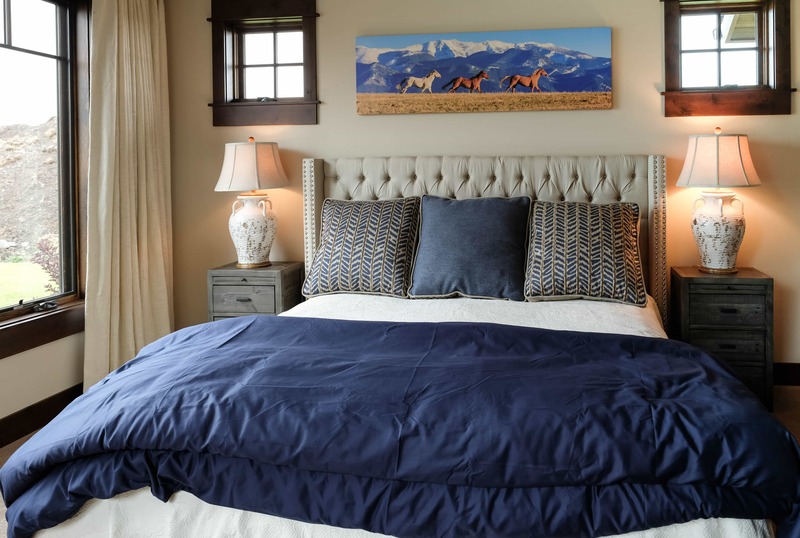 Here are some of my favorites from the Bozeman Parade of Homes area with you! This room can be summed up in one word: T E X T U R E ! The layered rugs and the pops of color make this space feel like somewhere you can relax in style! I love all of the rich tones in this family room. 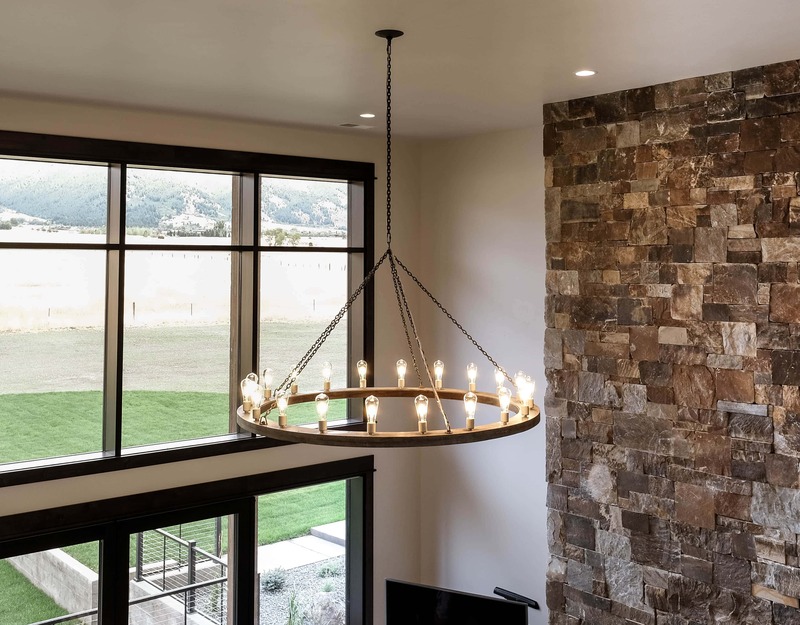 The planked ceiling and stone fireplace offer character while also creating a warm atmosphere to enjoy. 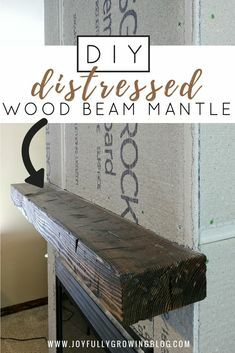 Related: How to Create a DIY Distressed Wood Beam Mantel on the Cheap! The live edge console table is a perfect addition as it pops against the neutral sofa. These fun accent chairs make great additional seating. Add a few throw pillows and some greenery and it becomes a cute and functional corner! 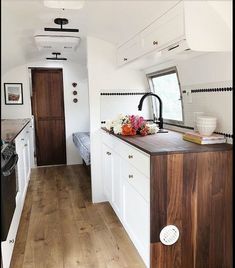 Just look at the finishes in this kitchen! White countertops against the grey subway tiles, butcherblock island and beautiful dark cabinets give this space a polished finish. In a world of white kitchens, this kitchen is so refreshing! Also – how cool are those wine class chandeliers? What a fun way to store your glassware! If you follow me on Instagram it won’t surprise you at all when I say that I am O B S E S S E D with this dining space. The wood table with hairpin legs and matching bench, the leather chairs and the cowhide rug… all I can say is YES! Dusty pink tufted headboard? Yes, please! These farm animal pillows are too cute! Perfect for a boy’s room or guest room. 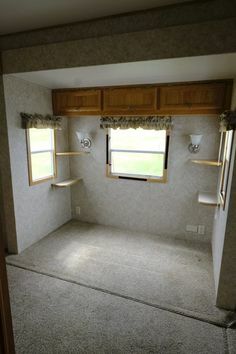 Someday we will live on enough acreage that we will be able to surround our bathtub with windows and not have to worry about neighbors. Someday. 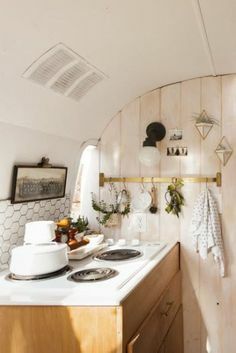 This bathroom was my favorite. 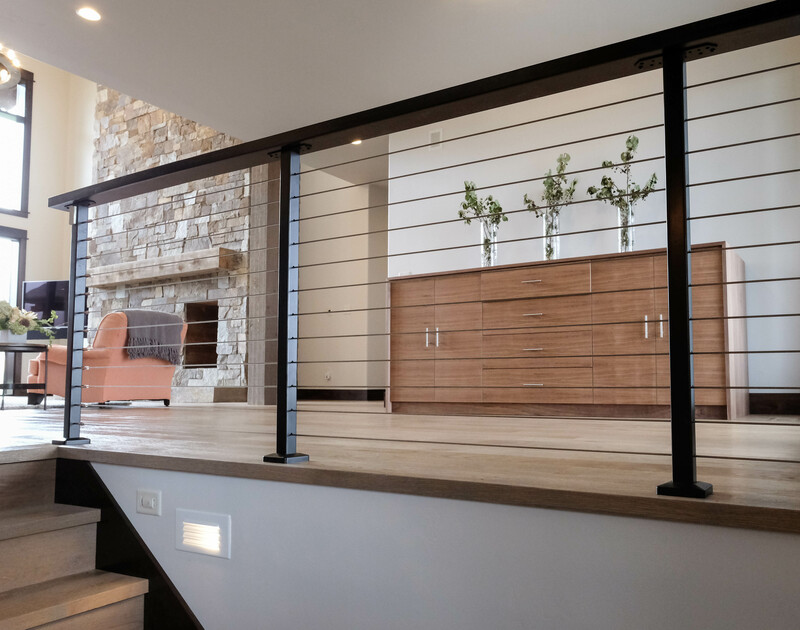 The wood mirrors, gold candle holders and light finishes give off such a clean feeling. Exactly what I want in a bathroom. Another view of the previous bathroom. 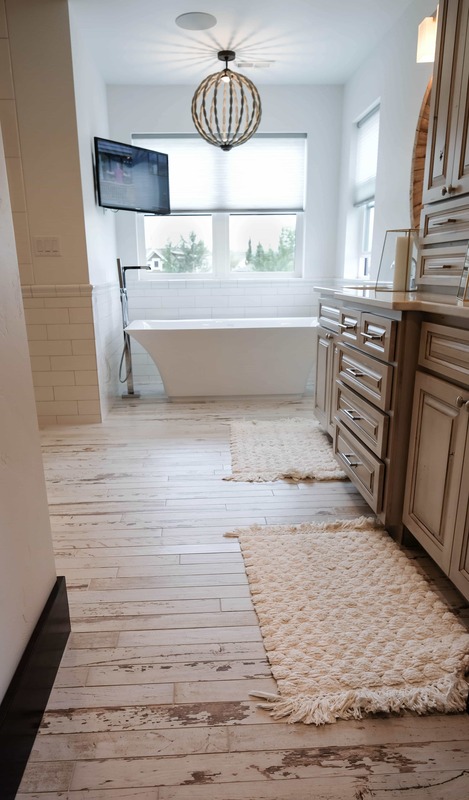 The floors are a wood-look tile that gives off an unexpected rustic vibe in this modern bathroom. Love that addition. If you weren’t aware yet – Yes, wallpaper is back in style. 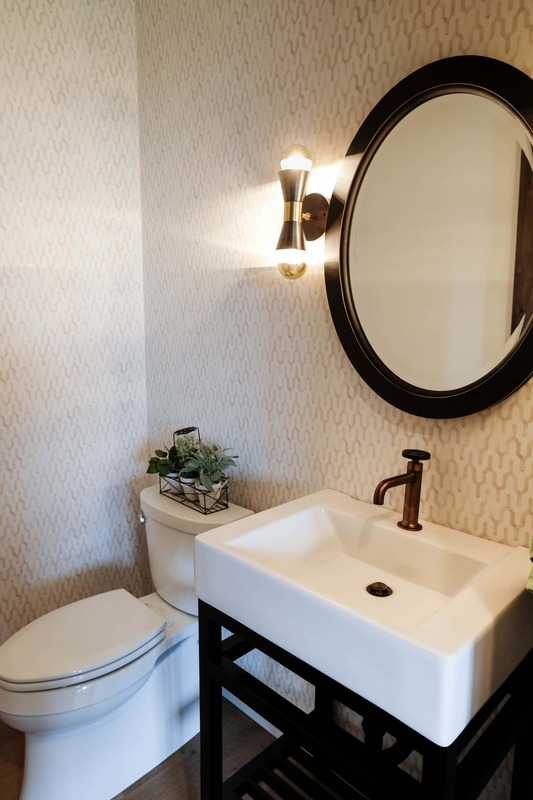 I love the print they chose for this half bath and the soft touch it provides against the dark accents. Styling shelves can be so much fun, but also very frustrating. Take a tip from these perfectly styled floating shelves: decorate in groups and mix it up! I love how the designer used books to add height. I spy an abandoned mimosa… The builder/designer team in this home went above and beyond offering all of the guests a complimentary mimosa! 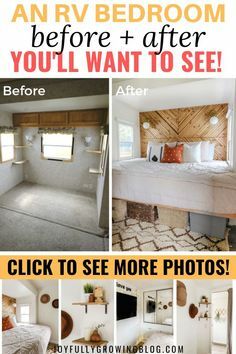 I hope you found some inspiration while browsing these images! 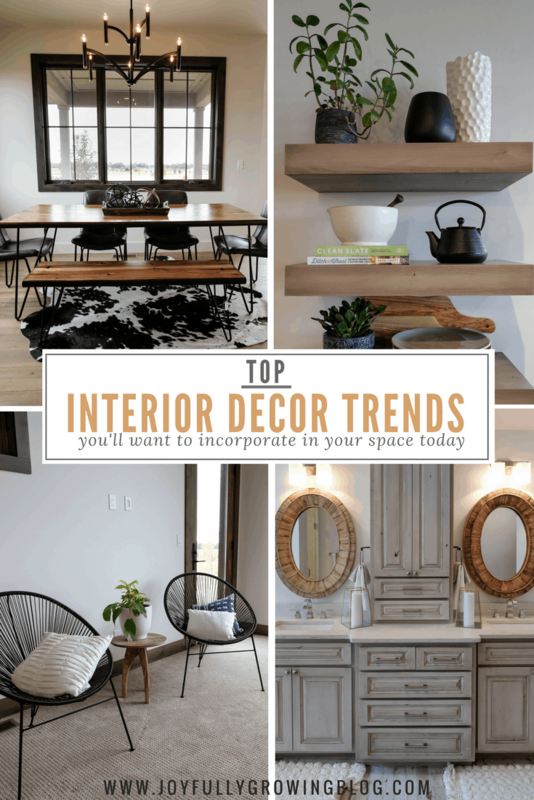 For more decorating inspiration and tips, head over here next! It probably depends on the host you are using, I don’t know much about it other than mine was set up for mobile automatically by using WordPress.com. 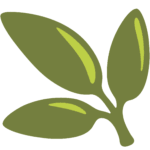 I would call the customer support team for your hosting site.